Exhibition stand halls are often filled with an overwhelming amount of exhibitors. This is why it is vital to go above and beyond to make your exhibition display really stand out from the crowd. After all, it is the displays that stand out which visitors are most likely to visit. 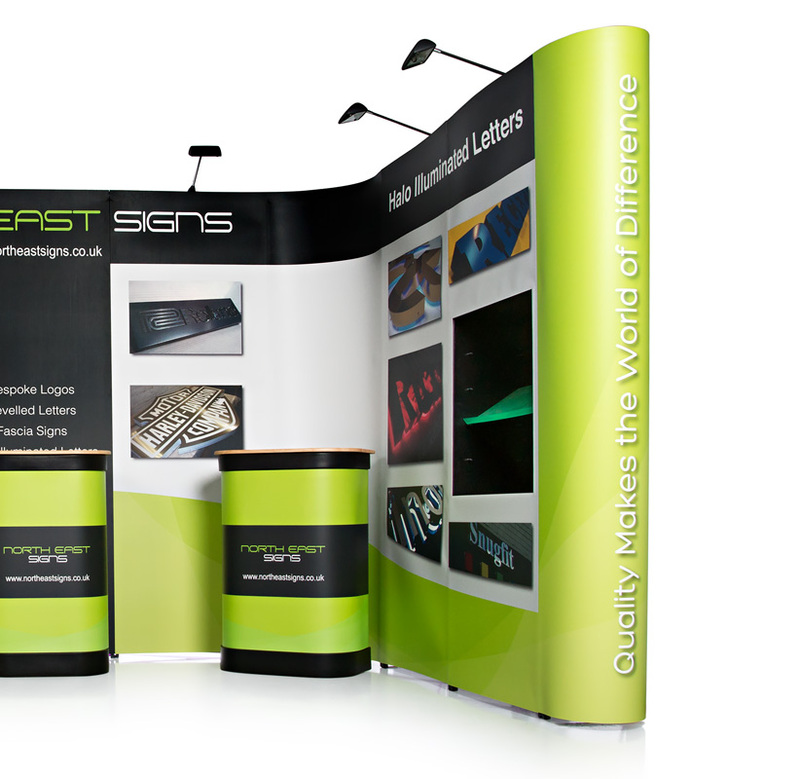 Adding accessories to your exhibition stand is a great way to increase appeal to visitors wandering around. If your exhibition space has room to add accessories then definitely do so to increase your chances of attracting potential clients. Did you know that a huge 80% of people recall a video they have watched in the past 30 days? When you’re competing against hundreds of exhibitors to have your business remembered, adding an audio-visual element like video is essential. Adding media to your stand creates an interactive element, enables you to attract visitors to your stand and prolongs the period of time spent on your stand to give more opportunity for engagement. There are varying ways to show your video media on an exhibition stand. If your stand configuration is made up of a pop up stand then an integrated monitor bracket is ideal. The specialist monitor bracket attaches easily to the pop up frame and has a standard VESA mount plate which fixes to any flat-back screen. Our monitor bracket is compatible with any pop up stand and can hold a monitor up to 22” wide. Stabilising feet come as standard with the monitor mount for increased stability. 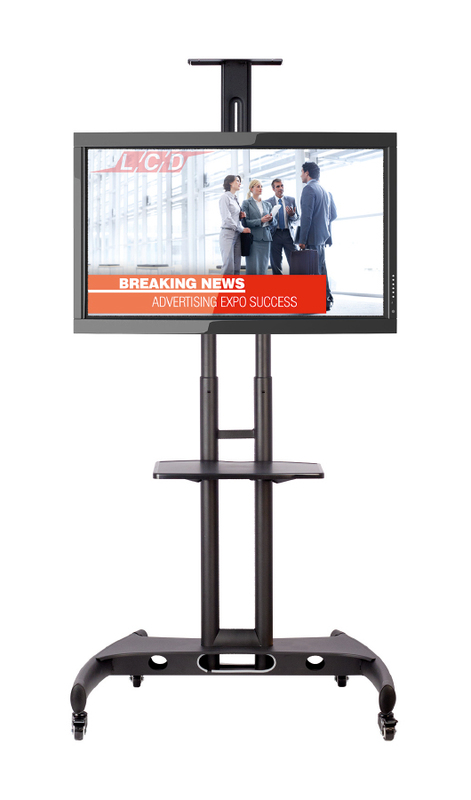 If you want to add a mobile way of displaying media then a mobile TV and monitor stand on wheels is a great choice. This is a portable media solution for mounting both TVs and monitors. The monitor stand can support both LCD and LED screens up to 60” with a weight of approximately 45kg. The stand features an adjustable plastic shelf which is ideal for storing components and accessories. An integrated cable management system is also included which allows cables to be hidden, creating a clutter-free appearance. Furthermore, this monitor stand is height adjustable so perfect for use in different exhibition environments. Adding lighting to an exhibition stand is a quick and effective way to make your exhibition display stand out among competitors. When you’ve worked hard on the design of your pop up stand, adding lights perfectly complements the graphic design and makes the colours pop. Our range of lights are easily installed on both pop up stands and banner stands. Lights are also adjustable so you have the option of choosing where you want people to focus on the display, be it your contact information, company logo or the graphic itself. Illuminating your exhibition stand is a perfect way to ensure your brand gets noticed. The Universal iPad and Tablet Stand is one of our most popular iPad stands at just £72.00. This freestanding tablet display stand will hold a variety of tablets, not just iPads. Ideal for events, showrooms and exhibitions where you want to engage digitally with your customers. The tablet enclosure can be mounted in either a landscape or portrait orientation, therefore, giving flexibility for use. Leaflet dispensers are an ideal choice for displaying corporate leaflets, brochures and marketing material. 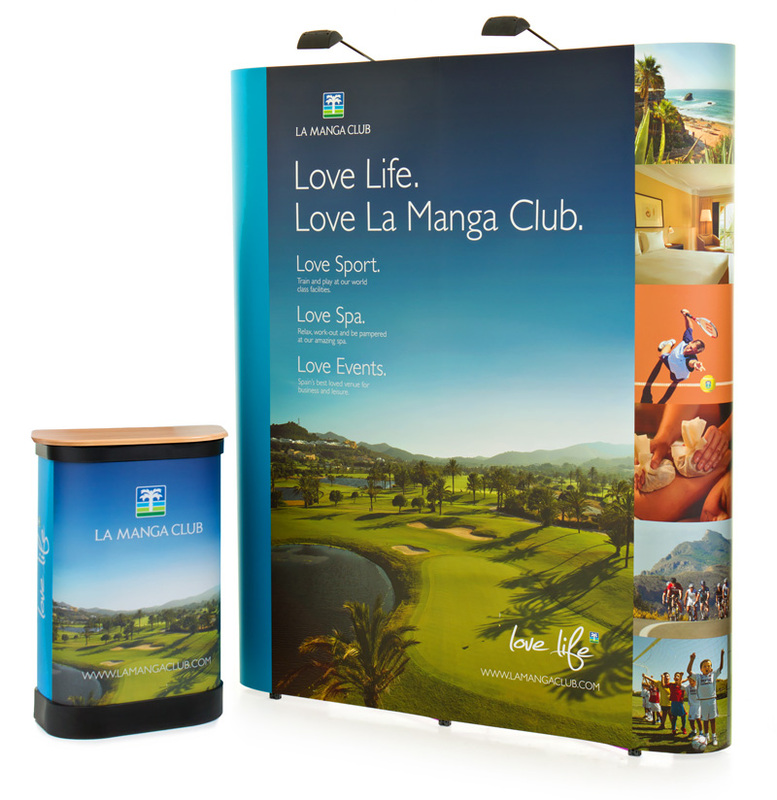 They enhance the look of an exhibition stand and as they are portable and freestanding require a minimum amount of floor area on your display stand. They are a great way to ensure visitors have a means of accessing marketing material to take away after an exhibition. You can easily incorporate a leaflet dispenser with a monitor stand with our audio visual and literature post. This uniquely designed stand is a robust, handy and versatile information and promotion post incorporating 6 literature holders and an LCD monitor bracket. A perfect compact literature stand and information point. Shelving units are available for our pop-up exhibition stands and provide your stand with more depth that helps to create a physical display area. Shelving units are commonly used to display literature or products but can be used to display anything you wish. The shelving unit sits neatly within the pop-up and comes with one acrylic shelf included however you can add an extra shelf if required. The unit will also hold up to 10kgs in weight and is available with lights if needed to really make your product stand out. 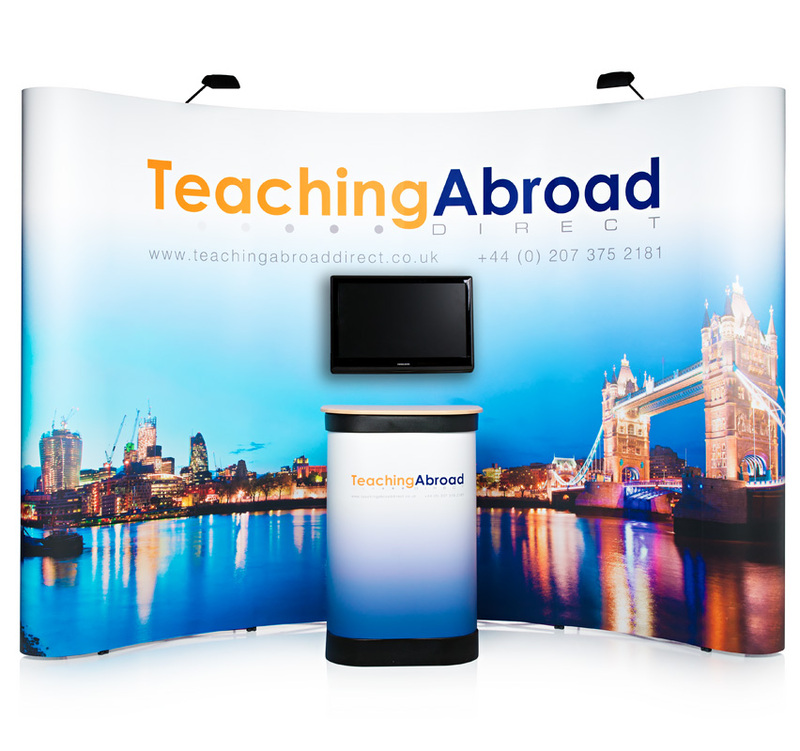 At XL Displays we offer a wide range of exhibition stand accessories to complement both pop-up exhibition stands and pull up banners. Please contact us or call our sales team on 01733 511030 for more information.